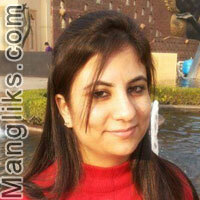 Sonal is an MBA by profession and works for Standard Chartered Bank - Delhi. We are a small family, I (father) am into business, my wife is a teacher in government school, and my son works for an American consulting firm in Bangalore. Sonal is Manglik, and therefore we are looking for a Manglik groom for her.